Addition of water and acid to a nitrile leads to the formation of a carboxylic acid. Nitriles can be hydrolyzed by acid or base to give the corresponding carboxylic acids. 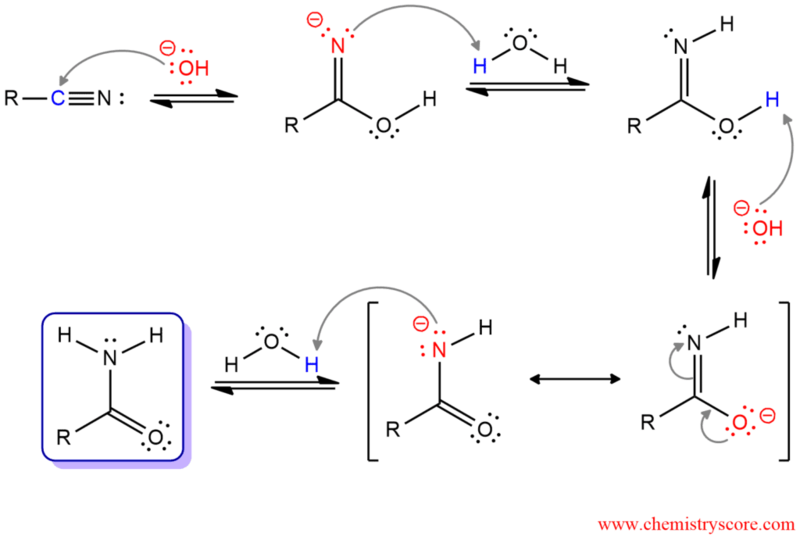 The mechanisms of these reactions proceed through the intermediate amide and include addition-elimination steps. In the acid-catalyzed process, the first step is protonation of nitrile group by acid to render it more electrophilic and better for the nucleophilic attack in the second step. Water function as a nucleophile and attacks the protonated nitrile. Loss of proton from oxygen furnishes a neutral intermediate which is tautomer of an amide. 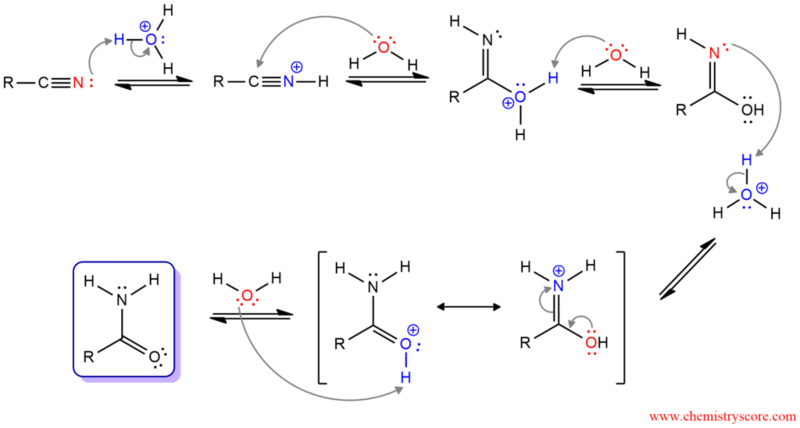 Then, the nitrogen atom is protonated, forming a resonance-stabilized intermediate. And finally, by deprotonation of this intermediate, the amide is formed. In the base-catalyzed nitrile hydrolysis, hydroxide function as a nucleophile and attacks the cyano group. The amide tautomer is obtained, which protonates on nitrogen in the next step. Hydroxide function as a nucleophile again and removes the remaining proton on oxygen to form resonance-stabilized intermediate. A second N-protonation gives the amide.